Yom Kippur presents Judaism’s annual encounter with the possibility of death, and of the possibilities of life. Our afternoon film helps us to ponder what it means to life a long and meaningful, joyful life. Lives Well Lived is a feature documentary film by Sky Bergman that celebrates the incredible wit and wisdom of adults 75 to 100 years old who are living their lives to the fullest. 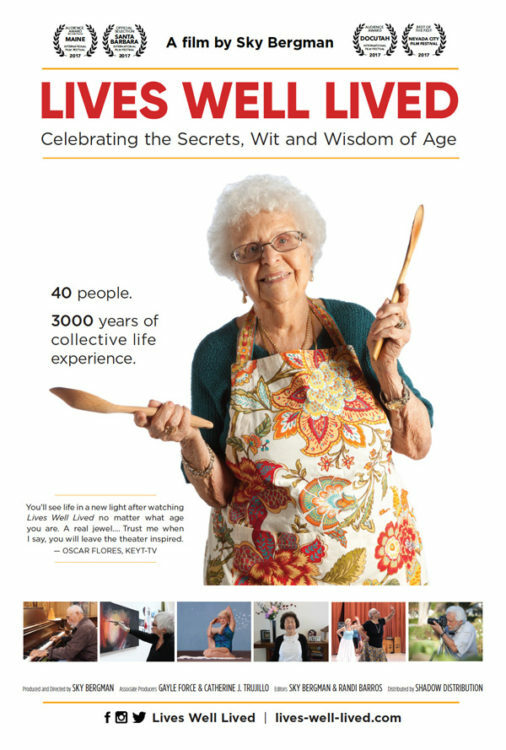 Encompassing over 3000 years of experience, forty people share their secrets and insights to living a meaningful life. Their intimate memories and inspiring personal histories will make you laugh, perhaps cry, but mostly inspire you. “Be endlessly engaged in whatever your passion is.” “Work a little less, spend a little less, enjoy life a little more.” “Sit loosely in the saddle of life as you go down the long trail.” These are among the many words of advice imparted by the 40 interview subjects in Sky Bergman’s documentary examining the lives of people ages 75 to 100. If you’re eager to hear even more pearls of wisdom such as these, you’re the prime audience for Lives Well Lived. It’s the sort of documentary that makes you feel bad for ever feeling bad. The filmmaker was inspired to make the film by her grandmother Evelyn, whom she started filming at age 99. Evelyn lived to be 103, long enough to see herself projected on the big screen at a film festival just three weeks before she passed away.